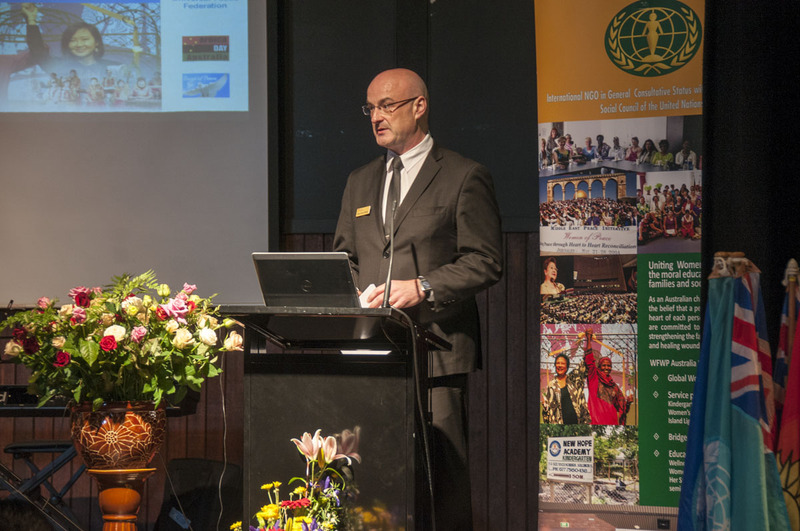 UPF Australia , Melbourne, Australia, September 19, 2015: Melbourne sunshine, energy and the warmth of friendship made a perfect combination for the ‘Peace Building in the Asia Pacific Rim’ conference on September 19th, commemorating the UN International Day of Peace. The co-hosts for the conference were the Universal Peace Federation (UPF) and the Women’s Federation for World Peace (WFWP). This year’s UN theme “Partnerships for Peace – Dignity for All” aimed to highlight the importance of all segments of society to work together to strive for peace. The work of the United Nations would not be possible without the initial partnerships that were active in its creation and the thousands of partnerships each year between governments, civil society, the private sector, faith-based groups and other non-governmental organizations that are needed to support the Organization in achieving its future goals. WFWP, having General Consultative Status with ESOCOC works to support the UN 2030 Sustainable Development Goals (SDGs) and is active in building Partnerships for Peace within each of WFWPs 120 national chapters. The SDGs WFWP International works to support are: ending poverty in all its forms everywhere; achieve gender equality and empower all women and girls; reduce inequality within and among countries; make cities and human settlements inclusive, safe, resilient and sustainable; promote peaceful and inclusive societies for sustainable development; and, protect, restore and promote sustainable use of ecosystems. Mayor Sean O’Reilly warmly welcomed the capacity crowd of 195 dignitaries, community leaders and participants to the City of Dandenong. Jenny Funston shared with us the vision of the World Peace Prayer Society and guided us through ‘May Peace Prevail on Earth’. Dr. Mimmie Watts, Patron of WFWP Victoria introduced our Key Note Speaker, Professor Yeon Ah Moon, president of WFWP International. Prof. Moon’s address focused on the theme of ‘living for the sake of others’, being the underlying philosophy behind WFWP International. She emphasized that harmony between communities and nations is only possible when it is first realized within oneself and ones families. As the family is the starting point of world peace, she emphasized that the role of women in creating peace within the family is pivotal and lasting solutions to our social problems can only be achieved when true partnerships between men and women are achieved in all levels of society. During the morning tea break we were uplifted with beautiful music from the New Covenant Samoan Choir, who shared their Samoan dancing and songs. 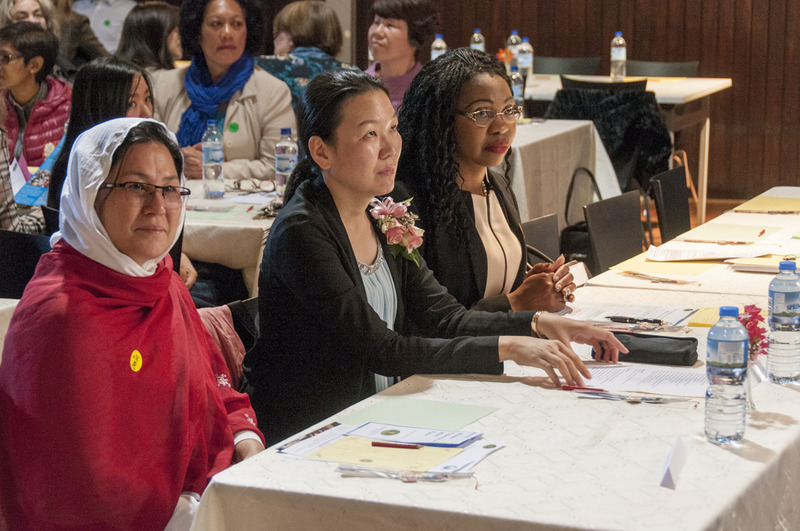 The break-out sessions provided an opportunity for participants to learn about the newly formed Victorian Peace Council spearheaded by UPF in Victoria. Please see the separate report for this session. 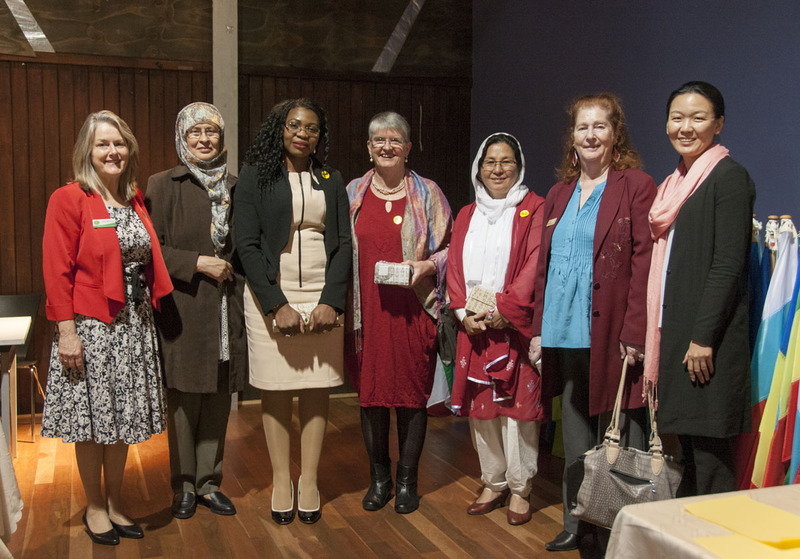 A discussion on the ‘Dignity of Women Project’ was emceed by Dr. Jacinta Morea and allowed us to participate in the launch of this initiative in Australia. Anne Bellavance, WFWP national president, presented a historical overview of the European Dignity of Women project to outline the mission, philosophy and outcomes of this project throughout Europe, from 2002 until the present. A panel session allowed brief explorations of dignity from three very different cultural perspectives. Dr. Mimmie Watts, a new Australian from Cameroon, Africa shared how women in her community are the heads of the household. What many Australians are unaware of is how coming to Australia poses a severe challenge to the family structure of new African Australians. Upon arrival, often it is the women who first find employment as caretakers, cleaners and in retail. This puts pressure on the family, because the men are not able to fulfil their traditional roles as providers for the family and they easily become depressed. Children pick up English easily but often cannot get adequate homework support at home due to their parent’s lower level of English and this further exacerbates the difficulty. In Australia the women are able to feel empowered, but for the first few years carry the burden of being the only source of income, until their men are re-skilled. Mimmie emphasized the importance of education to empower new African Australian families. Zakia Baig from the Australian Hazara Women’s Friendship Network spoke to us about women in her Moslem community in Pakistan and Afghanistan. She shared how her community is persecuted in their home of origin and how men and women do not have equal rights within society. 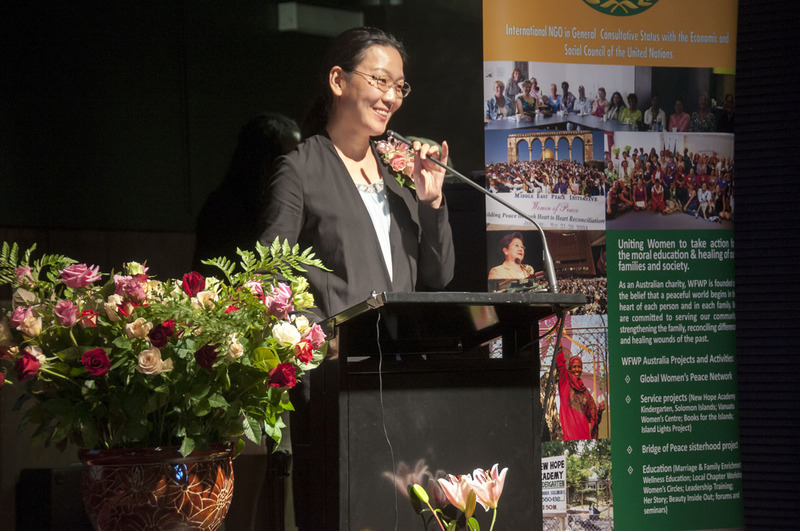 Zakia then expressed gratitude to the Australian people for welcoming the Hazara community so openly and giving women in her community the opportunity to feel more empowered to express themselves and find employment. Irene Anani, an expert on ‘Character Education’ highlighted women’s dignity from the Australian point of view. She explained that family violence is very real in Australian society, with 97% of the police reports being of violence made by men towards women and this violence occurs mostly from a known partner. Following the panel presentations the floor was opened up for discussion from the audience to gain feedback on how the ‘Dignity of Women’ project could be used as an effective tool within the Australian society. Unfortunately, time was not on our side and we had to conclude the session just as the audience was warming up. A promise to have another session soon will allow this exploration to be developed in the near future. Releasing the ‘Doves for Peace’ took everyone outside to Hemmings Park, where an excited crowd gathered around the homing pigeons ready to be released. John Hurley introduced the doves to lucky participants and demonstrated how to hold and release them. John’s grand-daughter, Jasmine gave the children an opportunity to release their own doves and showed them how to release the basket cover all together. With excitement we watched the doves fly off one by one. 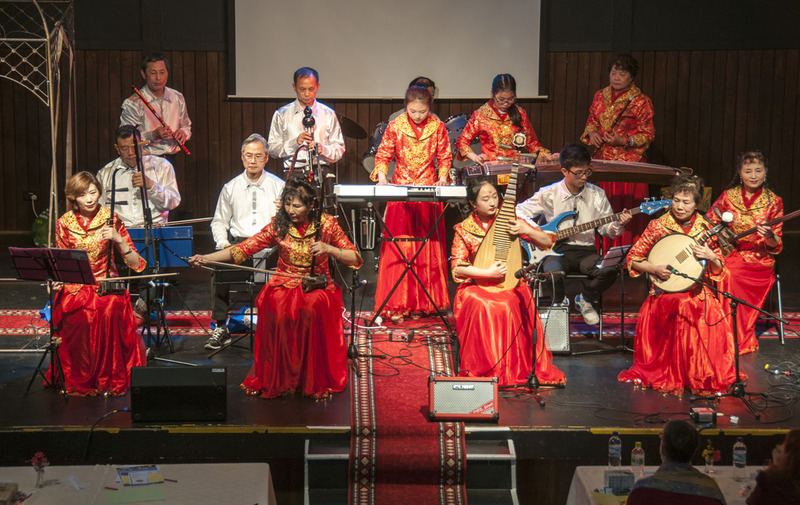 After the vegetarian lunch banquet, soulful classical Chinese music was performed by the New Eastern Arts College orchestra. Jennifer Xu is the school’s principal and founder. Jennifer specializes in the Chinese sitar and wanted to bring these beautiful traditional sounds & instruments to the public. The orchestra is one of our valued partners; students dressed in traditional costume dazzled and brought joy to everyone. The ‘Bridge of Peace’ moved our hearts and gave participants a real and empowering way to create personal bridges of reconciliation and healing with their new sister or brother. It gave an opportunity to connect in heart with someone from a different cultural background, heal wounds of the past, build lasting friendships and resolve conflict that may be passed on from generation to generation. 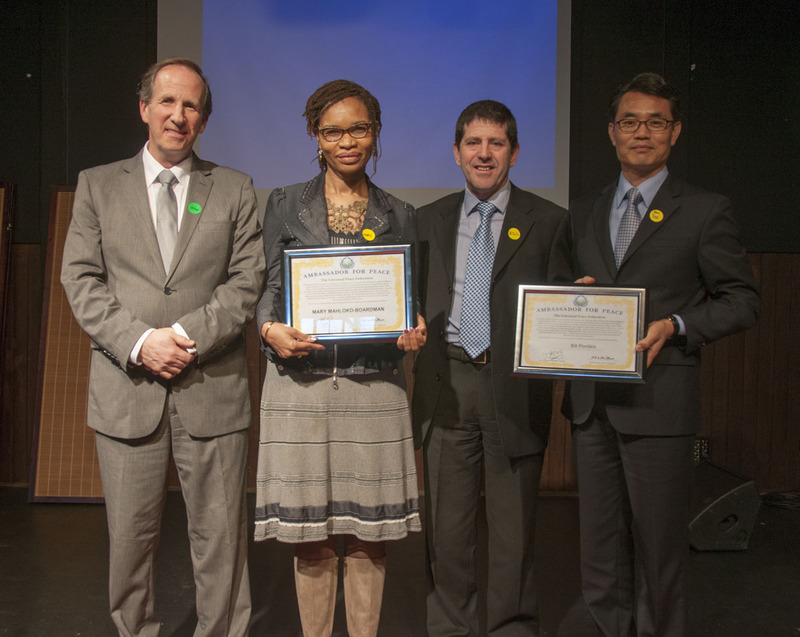 It is one of the signature projects of WFWP International and another highlight of the conference. Both women and men had the opportunity to demonstrate their new bonds of friendship, by passing under the beautiful Jewish Arch that serves as the bridge and greeting each other with an Oriental bow of respect and a western hug. Participants were encouraged to get to know each other during the day and to meet up after the conference. The final session of the day was the workshops. Our young MCs, Kosina Hanson and Jessica Greenall kept the two workshops upbeat. Dr. Mimmie Watts gave a brief presentation on ‘Migrant Women, Culture and Contraception’. At each table we then had the opportunity to discuss four questions as a group about our views on the use of contraception. Feedback from the audience was then received. Afterwards, Mimmie read out and answered three anonymous questions pulled out from a box from which participants had previously written private questions to her on the subject. Rick McInerheney is the director of Love Skills, which is a provider of relationship skills program, and is an authorized trainer of ‘Mastering the Mysteries of Love’ (MML). Rick presented a before and after video clip of a couple communicating about their feelings. Participants were amazed to see what a difference skill training in empathic listening made to the couple. Rick then explained about the MML program and how too often in a relationship we are present but we do not really listen to each other. In pairs we then had the opportunity to practice this newly learnt sounding back skill, as we shared a childhood memory to each other. Volunteers then gave feedback to the audience about what was experienced and felt by each other. Comments during the day from participants include: “it is such a casual and friendly atmosphere that represents Australia”, “We should have more practical ways of creating peace like this”.